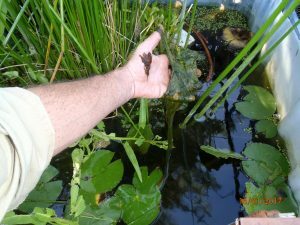 Tree Frog Permaculture | Permaculture design, education and implementation. 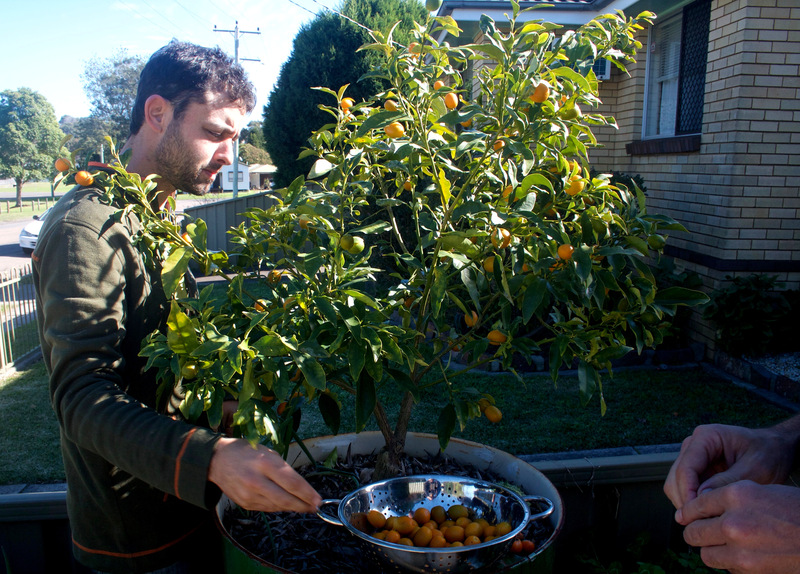 The importance of sourcing food locally and where the ‘Newcastle Farmers Markets’ can fall a bit short. Primary Producers get a very rough trot with food prices driven by harsh deals and bullying from Supermarket chains so the Supermarket chains can still make profit while selling a products at unreasonably cheap prices. SM chain ability and willingness to import food from far afield helps devalue locally produced foodstuffs. This pressure on farmers contributes to damage of our food security in several ways…. Smaller producers don’t get deals to provide SM chains produce as these poor prices mean only very large producers can meet the set requirements. This has created a food marketplace that doesn’t favour diversity of food types or diversity of location where any food item is grown. It is beneficial to have larger number of smaller producers rather than fewer massive ones for the sake of product diversity, redundancy and food security resilience in the face of climate change and its associated unpredictable climate swings and natural disasters. A great example of this, is the banana shortage in 2011 caused by a cyclone Yasi wiping out the majority of all Australian banana plantations in one event. The less distance food travels, the less need for packaging waste and unhealthy preservatives, also the greater chance of us being able to access fresh products that store and travel less well (because they don’t need to!). Of coarse, don’t forget the concept of “Food Kilometres” which talks about how much extra carbon we are expending into the atmosphere for every additional km food has been transported. This is only a part of the carbon footprint of a product but it is one that we can somewhat improve for those foods that you can actually grow in your region. I’m not saying we should never engage in imported or long-travelled products that might not be able to grow in your area, just that we can do way better with all of the things we can produce near where one lives. There are produce vendors that buy from a larger vendor and resell the product for a higher price rather than value-adding, and are thus adding to the cost of a product without actually contributing anything to its value. By value-adding I refer to; drying, pickling, candying, cooking with it, etc. The more of these buyer/sellers or ‘middle men’ a product goes through, the more inflation occurs when really that money would be better off in the hands of struggling producers for the sake of the continued availability of that food. If you are lucky enough to live near or drive past a farm, buying from a Farm Gate stall is a fantastic way to reward a producer for their fresh produce as the money goes straight to them! What about the Newcastle Farmers Markets you say? Well… personally i’ve been finding it harder than it should be to locate locally grown produce that hasn’t come from further than 50km away. Some producers are within the local area but in total very few, while many are still just vending the same product that is sold at supermarkets. This can make it difficult to find product that is genuinely embodying the qualities of local, affordable, if not organic, when relying on the word of a vendor only. Perhaps this needs to be left to some sort of screening process for who participates in a given market event? There are some nearby avenues through which you can more easily access locally produced foodstuffs that are definitely worth mentioning. Newcastle also has a Food Collective which allows you to order online which options to collect from 50 Clyde St Hamilton North, drive-through or have delivered. Aaaaaand finally, I know it isn’t for everyone and i’m definitely biased, but growing what you can where you live is the very best way to obtain at least some of your food for yourself and family. You also access the plethora of other benefits that having a garden can afford you and your community. 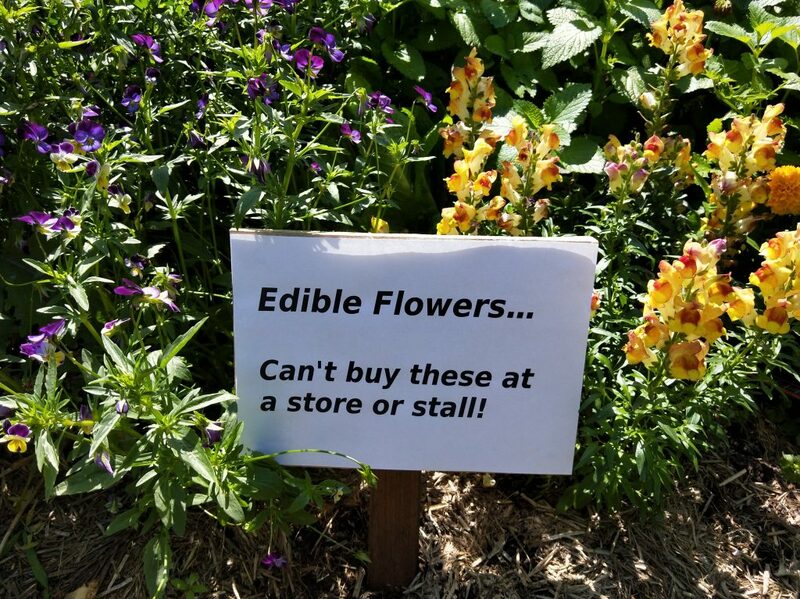 Good luck finding someone selling edible flowers at a shop or stall. Productive gardens that can withstand holiday neglect! Sometimes I hear people say… “I cant have a garden, it’s too much responsibility and I like to go away on holidays”. Little do they know, it is possible to have the best of both worlds!! 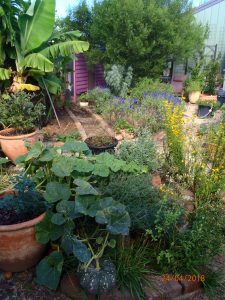 So much of the joy of growing using Permaculture principles and techniques is setting up a somewhat self-regulating and maintaining system which still provides you and other organisms with the things they need. For you frequent holidayers and other busy humans, there are a few points I can make to try and persuade you of this truth. As it happens, a key of it is to challenge and transform existing perceptions. There are some adjustments you can make to your idea of what is edible. Remember we only utilise around 2% of the world’s edible foodstuffs and many of these plants will grow for numerous years with minimal maintenance required. Unlike the annual vegetables you have likely grown up eating which tend to be at the higher end of the input scale, generally only living for a couple of seasons at a time. There are many annual edibles that happily self-seed and thus propagate themselves, meaning –> you don’t have to do it! 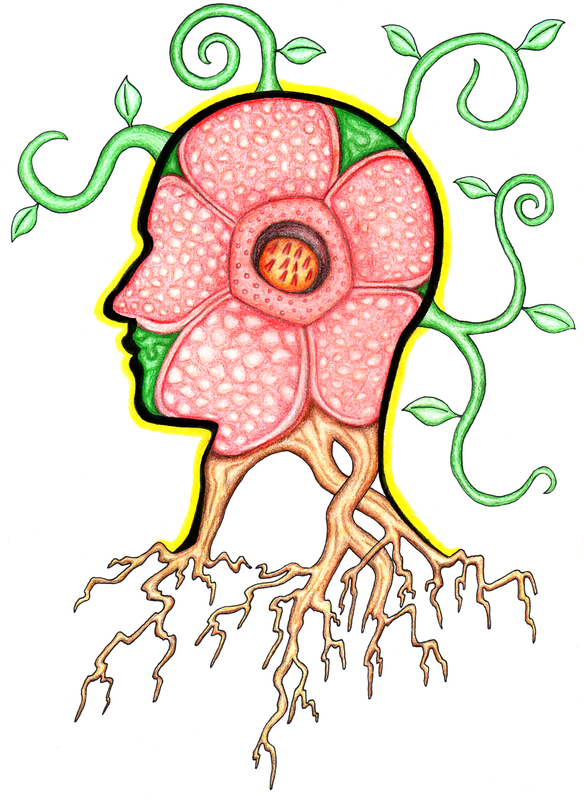 You just have to know what they look like and where to find them in your system, then let them flower and seed freely. Part of this will also mean figuring out which edible plants like your particular climate and soil conditions best and favouring the use of those, at least to begin with until more favourable and diverse micro-climates are created. 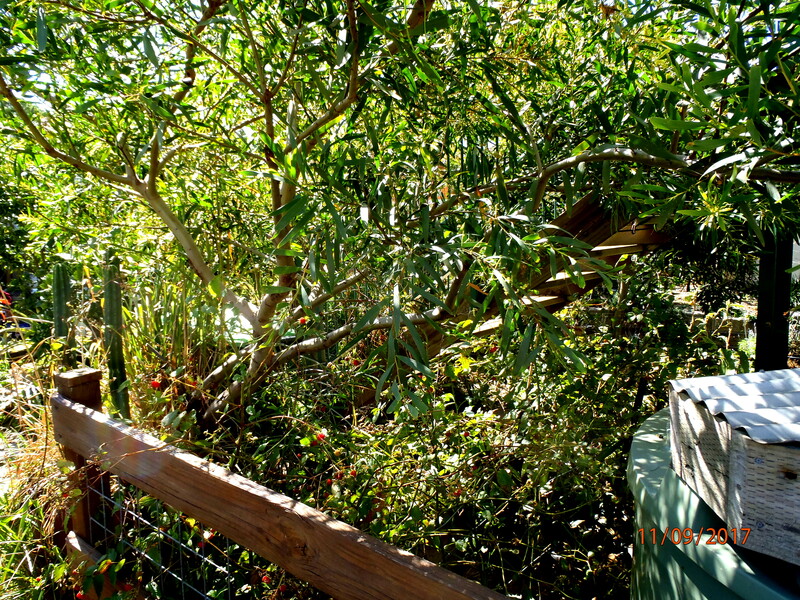 To the unacquainted, the more ‘untamed’ look of a low-input garden can be seen as just messy, unkempt or unstructured. 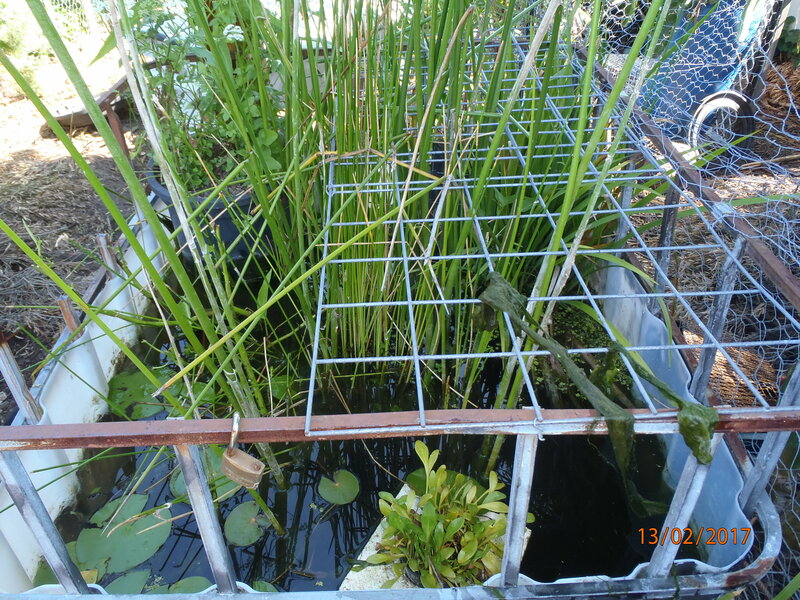 The thing is… plants organise themselves into a natural structure/order where they will perform the best. 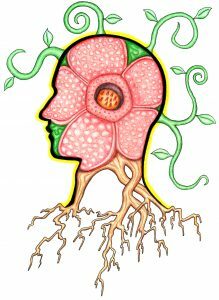 Often by taking plants and making them conform to our pre-formed ideas of order, they are put into spots where they do less well and thus require more input from us. As you learn more of this natural order, the diversity and cooperation you can see between your different garden elements provides the beauty and awe any garden can inspire. If you rail against the inevitable for long enough you can burn out and lose your passion. This uphill battle represents an enormous waste of both psychological and physical energy that could go into boosting your system’s productivity. It might be at this point you pull everything up and turf or pave the entire yard, then pay someone to pressure-spray or mow it on a regular basis. Ie; Puposefully desertifying your surroundings. The only organisms that win then are the Grass-cutters and concrete cleaners. 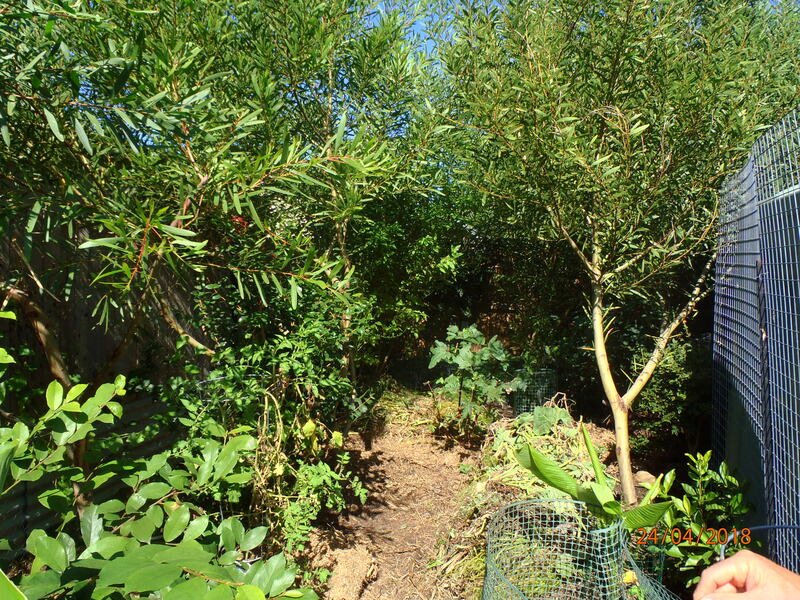 Alternatively, you could share a garden with a neighbour or utilise a local Community garden for your food production. Then you cab plant a lovely Native Habitat garden in the excess space instead which will still ‘give-back’ to you and the environment while still likely being even less maintenance than turf. Zone i… the internal Permaculture Zonation. 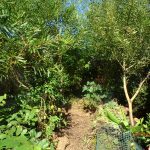 Permaculture psychology 101. Beware: More philosophical discussion ahead. I write this post as I have had difficulties in the past reconciling the feeling of powerlessness to change the issues facing us in the world. Environmental degradation, climate change, war… so many things seem too big for little old me to make a difference. BUT I CARE, and I cannot stop caring. I come across many others that care in my line of work and they often mention feeling or having felt very similarly. Hence my want to share my thoughts on this. Permaculture being a very holistic approach to life and sustainability, it would be silly to neglect the subject of our psychology within this. Especially considering our mental state guides the very ways we behave, decisions we make, and actions we take in day to day life. Following this logic, the setup and management of more tangible Permaculture zones (I→VI), even society itself, will be governed somewhat by Zone i/me. For human beings to make the right environmental decisions in order to minimise their continued negative impact on life-supporting ecosystems, awareness is crucial. If one hasn’t the specific knowledge of how their behaviour influences the environment, then acquiring the ability to choose the actions of lesser negative impact or greater positive impact isn’t possible. The more awareness we have and observations we make of our surrounding ecosystems, the more knowledge we gain on how our particular choices affect this environment, and the more power we gain to choose how we act accordingly. Granted, it is difficult for those fighting for their lives or well-being to find the time or energy to think and act on this scale, being more concerned with day-to-day survival of themselves and their loved ones. As such, those of us with the privilege to live in the first world and have ready access to the appropriate knowledge, have the responsibility of forging the way on these important local and global matters. However, the more you know, the more deliberation is required in working out the path of lesser destruction. This process of deliberation requires a greater expenditure of energy, and becoming aware of the faults in our current method of existence can be painful. Especially as by knowing of a problem, there follows some degree of responsibility within your individual power to improve on it or fix it. It is this effort and pain that many people, perhaps the vast majority, wish to avoid. Finding it easier to just keep following the old comfortable behavioural patterns already developed and known. It is at least partly this path of least resistance and humanity’s penchant for it that drives the need to maintain the status-quot in the face of massive climate change. Ironically, what will end up a much more painful and destructively forceful change in our collective behaviours in the long run. So… in order to make a change from current standards of living to much more equitable and sustainable standards, one must endure suffering. There are things one must give up, things one must change, things one must repeatedly consider… but the other side of this coin is a sense of connectivity with nature, local/global communities and a sense of peace knowing you are doing your part. Different individuals will have a varying level of innate tolerance or resilience to dealing with this suffering. Some will be barely able to function under the pressure, while some will have an inexplicable drive to forge through it and overcome it. The feeling of being overwhelmed can be easily reached when the problems are so numerous and complex, lending itself towards a mode of ‘analysis paralysis’. In this state, it is tempting to just say “its too much for me to handle so i’ll do nothing”. Nevertheless, to do nothing is to be part of the problem. However I maintain that regardless of your personal ‘innate’ level of resilience, there are tactics that you can employ to help improve your ability to tolerate this required suffering. The trick is to balance the weight of this responsibility with your actual ability to create change, not letting the seemingly overwhelming number of problems confronting us as humanity push you back into a pattern of ignorance and lethargy. If you start small and work your way toward a greater understanding, your ability to tolerate the necessary burden will grow with that understanding. Also, you will gradually access more of the positive feedback of love and connectivity which helps power the furthering of the journey. Limiting excessive or unnecessary exposure to sensationalised news cycles can definitely be somewhat helpful, as long as you aren’t completely cutting yourself off from new information. It has helped me personally to remember that an individual has only so much time and energy per day and lifetime. Believing you can do more than what these time and energy limits allow is a fast way to burn-out, fostering more disappointment at your lack of effective impact. There are ways of spending this finite time and energy that can maximise your individual impact such as; setting a good example, educating others and collaboration. Setting a good example: By making the best, most appropriate environmental choices available to you, you are proving to others that those choices are viable and an available path for others to follow. Educating others: Your positive impact on massive problems can only be so much as a lone individual, but as soon as you make the information/knowledge available to another human your impact can be multiplied many times over. The best way to do this is not to ‘preach’, but to engage in thoughtful discussion and conversation. Coming from a ‘holier than thou’ position tends to breed resistance to an idea. Collaboration: The Capitalist model of current society encourages competition as the main operative relationship option, particularly in business. In nature, sure there is competition, but there is also an enormous number of diverse forms of collaboration. Many hands make light work and it will take a collaborative effort to overcome all of the issues facing us on this earth. It is also important to mention that as social beings, collaboration is a great way to reaffirm that we are not alone in this battle and there are an increasing number of others on the same page. Technically everyone on this Earth is on the same boat, sinking or not. The other day, an older white male was wandering by a Merewether verge in which several Acacias (Wattles) have been planted. The predominant comment this man made was… “Wattles?! Why would you plant those useless things? !” This reaction is one that I have some across a number of times now, and I believe that it comes from the meeting of a few societal trends and a lack of ecological understanding which I will try and rectify in this article. This attitude meets with something I’ve encountered fairly frequently in plant selection (outside Permaculture circles at least)… people can be uneasy with plants of shorter life-span. Be it for the reason of wanting to keep their paid-for product around for as long as possible, or the whole concept of death seen as solely a bad thing and an uncomfortable reminder of their own inevitable demise. Acacia moderating heat-stress on veggie garden. Railing against the truly inevitable is a profound waste of physical and psychological energies, so I believe it is worth shifting our approach to the transience of life. To be comfortable with change as change is inevitable. EVERYTHING is impermanent and without death, there would be no new life. A wise guy from times of old named Heraclitus once said, “the only thing that is constant is change” which rings very true to me. I don’t mean, ‘once you’re dead we should all just forget about you’, but rather, instead of getting morose beyond mourning, we should celebrate what the dead-in-question loved in life and how that life is now providing the building blocks for other life. Look at the bush or a garden… it isn’t a painting, it is a living system that is always in flux and that flux holds its own distinct beauty. So really an individual’s value isn’t so much about how long it hangs around, it’s about what that thing achieves in that limited time and how many other lives it supports and benefits. Wattles are a great example of this, generally very fast growing and comparatively short-lived trees. The old adage ‘live-fast, die-young’ applies very well in that a single Acacia can produce food and habitat for thousands upon thousands of various animals and plants, during and beyond its lifetime, all the while acting to quickly protect and regenerate highly disturbed environments. Throw in that beautiful floral display and pollen that isn’t actually that likely to cause allergies compared to say Rye-grass that flowers at similar times… why on earth wouldn’t you plant some?!?! 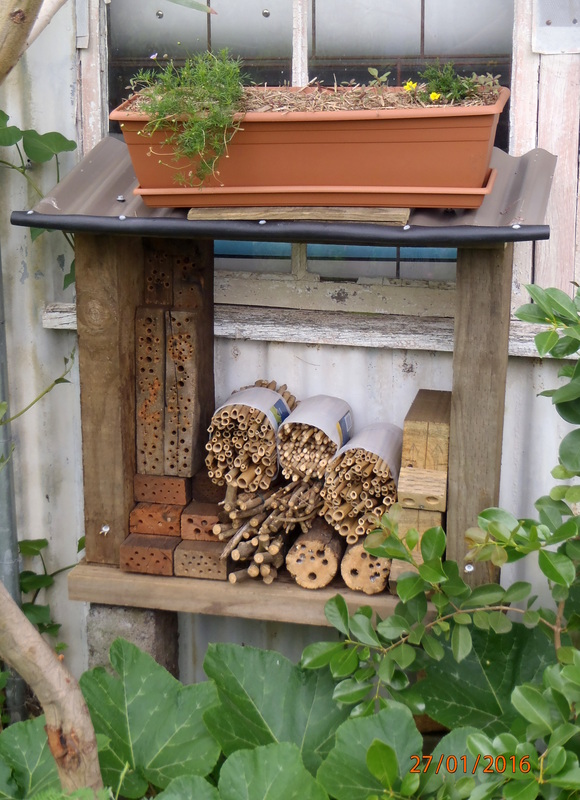 Australian Paper Wasps in the Garden â another case of Knowledge is Power! Often, when I talk to people about wasps, I find they look upon them very unfavourably as a menace to family health and often for this reason… something to be destroyed on sight. Most often the wasps that come to these people’s minds first are in the Paper Wasp family which, as their name suggests, build their fantastic nests out of papery material often found in protected locations under eaves and hidden in dense vegetation like hedging. 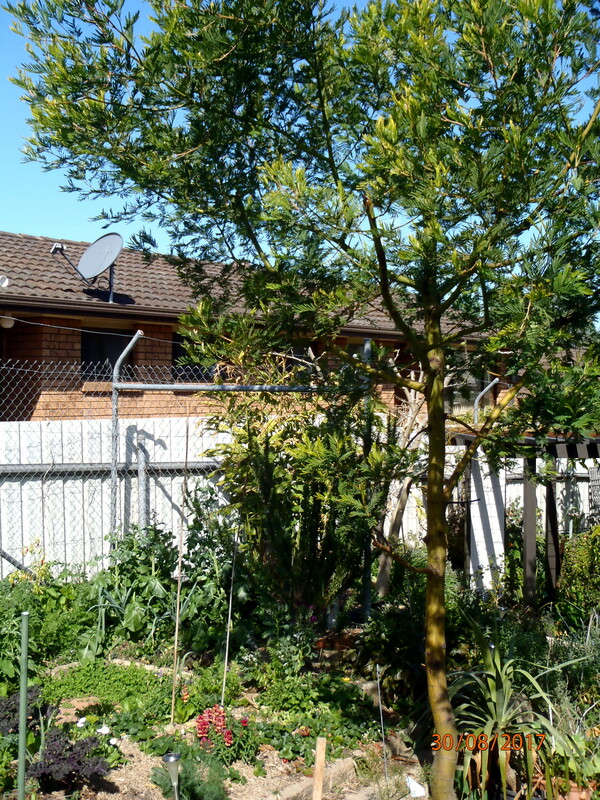 I believe one of the reasons they are more frequently found close to dwellings in suburbia is that they havn’t got as much access to all of the nice high ‘out of our way’ spots that taller trees and natural dense stands of vegetation that they’re used to in the wild. Lawns make terrible wasp habitat! The only time i’ve been attacked is if I’ve accidentally pruned too close to a nest I neglected to detect, in which case I say ‘fair enough guys, message received!’. 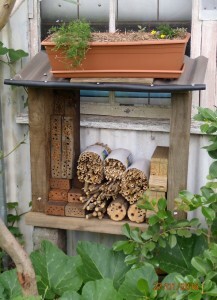 Working close to active nests, i’ve found remaining calm also helps in keeping the wasps calm. Of coarse I keep an eye on them for warning signs too, such as individuals on the nest beginning to turn and face you. 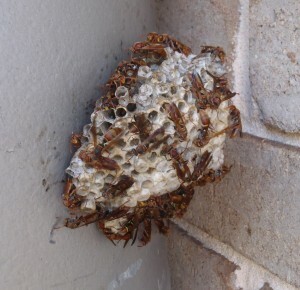 Now, don’t get me wrong… if a member of your family is allergic to wasp stings I can fully understand the need to keep paper wasp nests away from your living areas etc. BUT… I happily co-exist with these guys both where I live, and in gardens I work at all around the Central Coast and Hunter Valley. 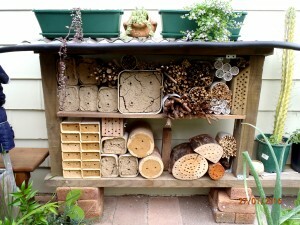 Not only that, but they provide a POWERFUL pest control function in these gardens which saves me a lot of effort and energy. As soon as a population establishes itself within range of a vegetable garden I see almost no Cabbage Patch Butterfly caterpillars on Brassicas (Cabbage, Cauliflower, Kale, Asian Greens, Broccoli etc.) with wasp individuals continually scouring leaves for more grubs. 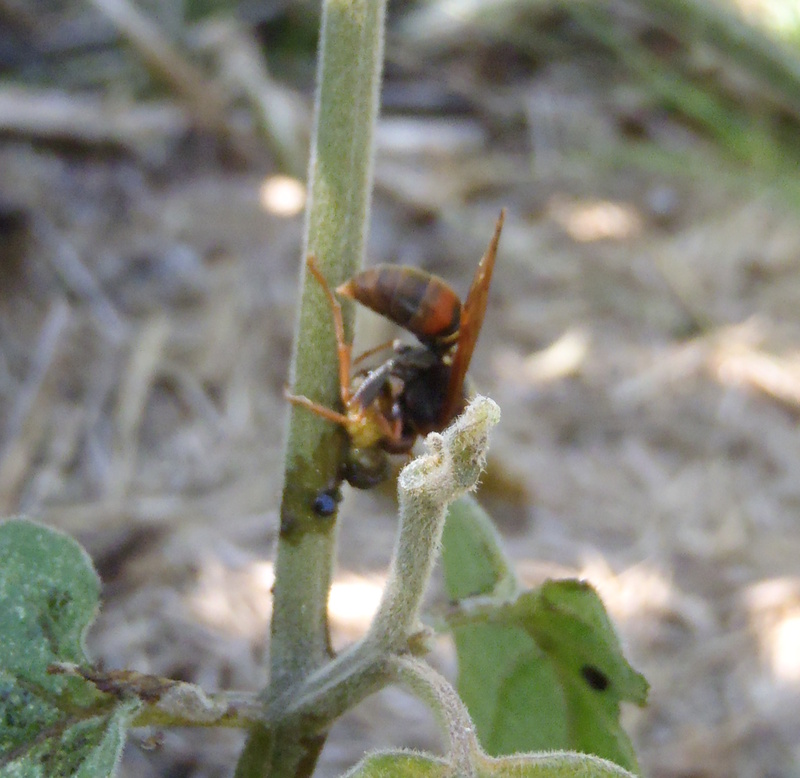 Native Paper wasps are also the only thing i’ve seen actively attempting to control the larvae of 3-Striped Potato Beetle (Lema daturaphila) making me think they’re likely to go for larva of Leaf-eating Ladybeetles (Epilachna spp.) too. Natural Pest Control Champions! So next time you find a Native Paper Wasp nest, take a deep breath, think again and evaluate all of the positives and negatives of its presence and location. If you still want it gone, perhaps think about armouring up and translocating the nest rather than burning or poisoning the whole colony. A bit of knowledge can make all the difference in how you regard these amazing little critters! 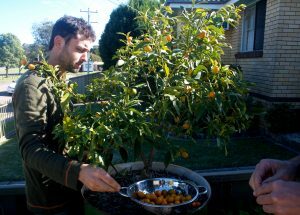 Grafted versus Non-Grafted Passionfruits â Possibility for alternative rootstock options? Now, there are very few people from experience that don’t like eating Passionfruits in some form or another. 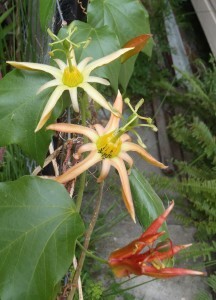 Common, easy to grow and sweet, these relatively thirsty climbers have been grown by households in Australia for a long time. 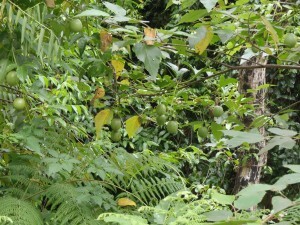 When you go to acquire an edible Passionfruit plant in Australia you have a few main options; the variety â Black, Panama, Banana, and whether it is grafted or un-grafted. First available in the season are the grafted var’s as the non-grafted take a little longer to get going. You may be wondering… whats the real difference? I personally avoid buying grafted Passionfruits as the rootstock used is from an exceptionally weedy Passionfruit variety from South America called Passiflora caerulea. The reasons given for its use as a rootstock is that it is cold-hardy and disease resistant, but it also readily sends sub-surface runners and shoots out which have to be constantly kept back or it will quickly overtake the top of the graft (desirable bit) and probably a lot more of your yard! Vigorous to the point that it will smother vegetation in yard and bush alike, it also produces natural cyanide in its stems, leaves and immature fruits so don’t let livestock or other animals (incl. children) eat it either. I feel that part of the reason Blue Passionfruit is so frequently used as rootstock may be that a single plant will produce 1000 plants for grafting onto due to its running habit and that saves money, effort and time growing 1000 whole other rootstock plants as grafting fodder. Blue grafted varieties may be right for you. The rootstock being a bit less excessively-vigorous in the cool but you’ll still need to keep an eye on those runners as it can still be a weed in these areas. 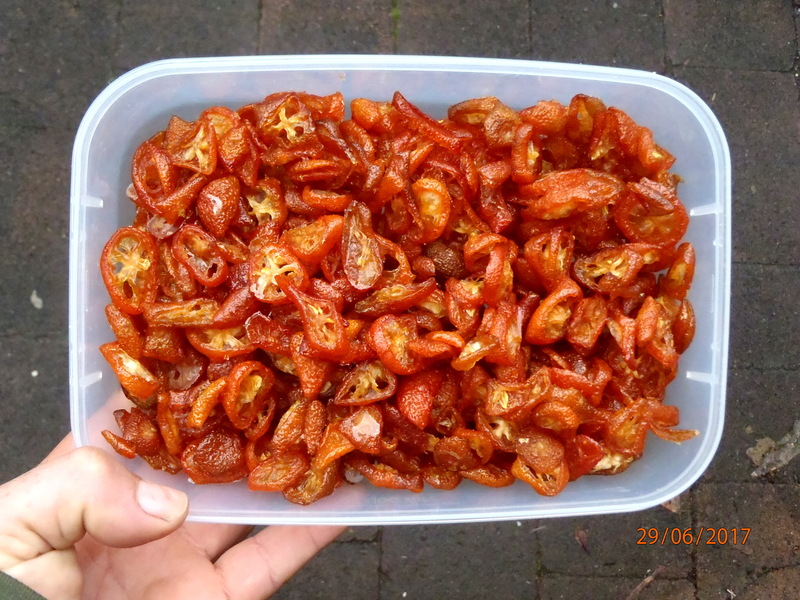 Possibly growing these in a container may help you to restrict much of this unwanted spread. If you live in an area classed as warm-temperate, subtropical through to the tropics you’ll be able to grow non-grafted Passionfruit quite easily and with much less maintenance. The trouble more seems to be keeping water up to them in a low input system. Ie; minimal fertilisation, watering etc. tending to do much better in a partially sheltered understorey situation. 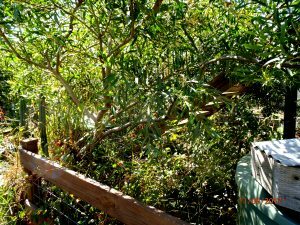 The main basis for this post is that i’m growing a native Passionfruit (Passiflora herbertiana) which is a bushfood local to the NSW east coast and ranges, into Queensland. 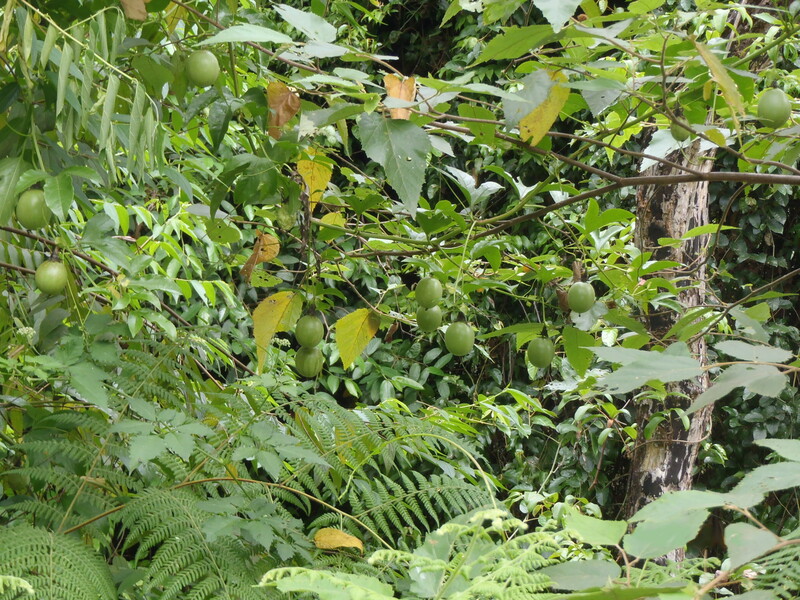 The fruit itself is small, edible and sweet but has a distinct aftertaste. 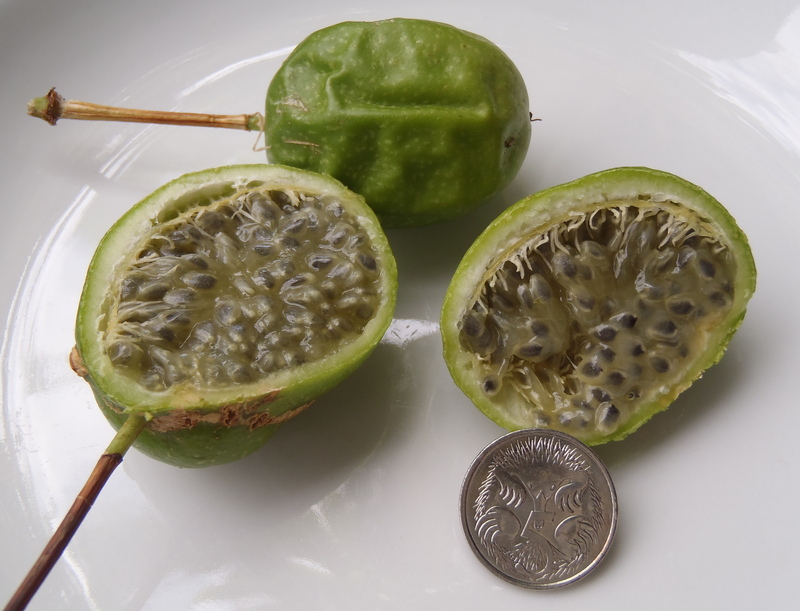 I havn’t heard of anybody trying thisÂ but I wonder if using this native species as a rootstock could reduce the relatively high water requirements of the cultivated Passionfruit varieties. At least for the areas where the native has natural distribution. I believe Passiflora herbertiana is not as cold hardy as Blue Passionfruit but having evolved in an arid country like Australia I assume it is more ably adapted to drought and minimal irrigation. Also the risk of it taking over or becoming an environmental weed is about zero. What does this title mean?! Well… i’m on about vegetables called Artichokes. In the vegetable world there are three kinds i’m aware of so far, all rather distinctly unrelated to each other! Globe Artichokes (Cynara cardunculus var. scolymus) â cultivated from a type of thistle with the core of the young flower buds eaten, steamed or picked. These are what you’d probably think of when you first hear Artichoke, buying them ready-pickled in jars from the supermarket. 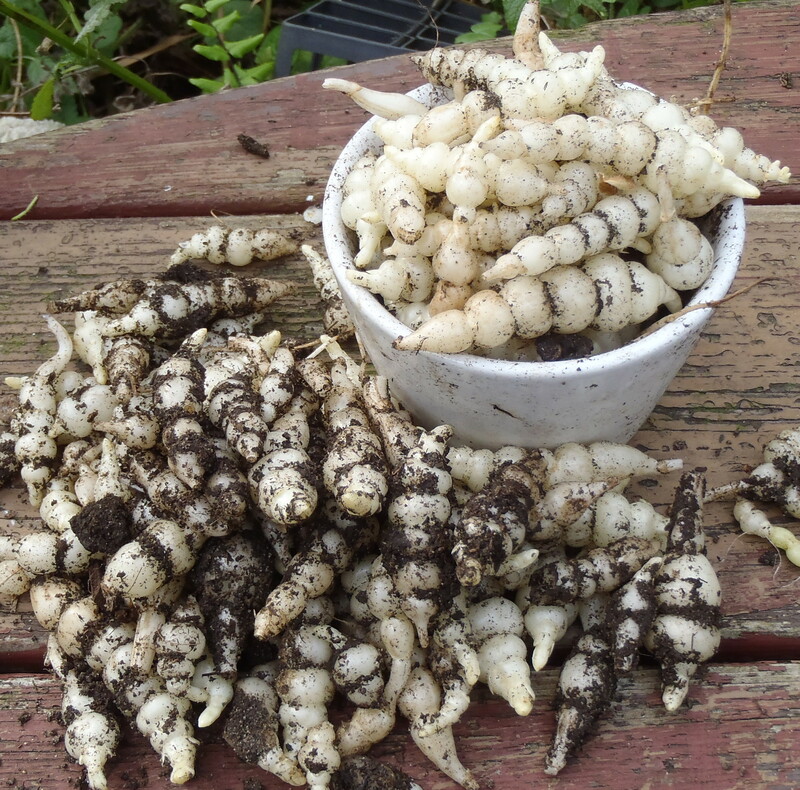 Chinese Artichokes (Stachys affinis) are closely related to Lamb’s Ears (good Permaculture toilet-paper) and in the mint family. Another name which I might try to use for these are ‘Crosnes’ as there seem to be a number of recipes using that name. Recently, I came across these at random in a catalogue and decided to give them a try last season. Recently had my first big harvest which prompted this article. 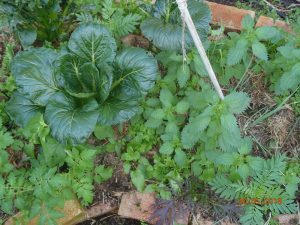 The plant can be treated as a mint in that it likes a moist positions ends shallow runners out rapidly to fill the space it’s grown in. This spreading is a good thing though because Where Runners Go â Crosnes Grow. It also seemed to grow quite happily around and beneath numerous other plants in the bed. 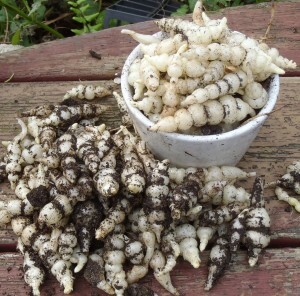 Harvest when the plant plant dies back in winter and you’ll find these amazing pearly white smooth grub-like tubers in the first 10cm of soil. They can be eaten fresh in salads or cooked in stir-fry’s for a crisp and refreshing texture that remains after cooking. Mildly flavoured but I think totally delicious! In fact I’m so thoroughly overjoyed with Crosnes that i’ve been spruking them all over the place! The main reason that we don’t see Chinese Artichokes or Crosnes in the supermarket (at least in Australia) I suppose could be due to the fact that they rapidly dry out in the open air. They can be effectively stored in a container of moist coconut peat or sand. 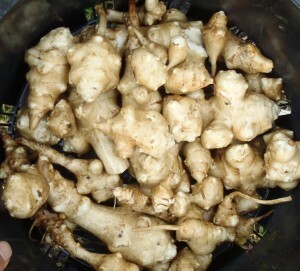 The same goes for storing Jerusalem Artichokes.